Ukrainian armed forces positioned near the Russian-Ukrainian border were attacked by artillery fire in the summer of 2014. Between 9 July and 5 September 2014, the Ukrainian Border Service and the National Security and Defense Council reported more than 120 artillery attacks from Russia. Russian officials, however, have denied the existence of any artillery attacks on Ukraine originating from its territory. The pressure of sustained artillery attacks through early August led Ukrainian armed forces to lose control of hundreds of kilometers of border territory. Google Earth satellite images of eastern Ukraine from July, August, and September 2014 have enabled the Bellingcat investigation team to find evidence of these artillery attacks, determine their origin, and compare them with local sources. After reviewing and analyzing these satellite images as well as videos from social media, local media reports, and the shifting maps of the ongoing conflict, the Bellingcat investigation team has determined that there is compelling evidence that artillery attacks on Ukrainian territory and against Ukrainian armed forces originated from the territory of Russia. A PDF version of this report can be found here. In July 2014, Ukrainian armed forces launched an “anti-terrorist operation” against pro-Russian separatists and made significant territorial gains in eastern Ukraine, regaining control over a large portion of the Russian-Ukrainian border. 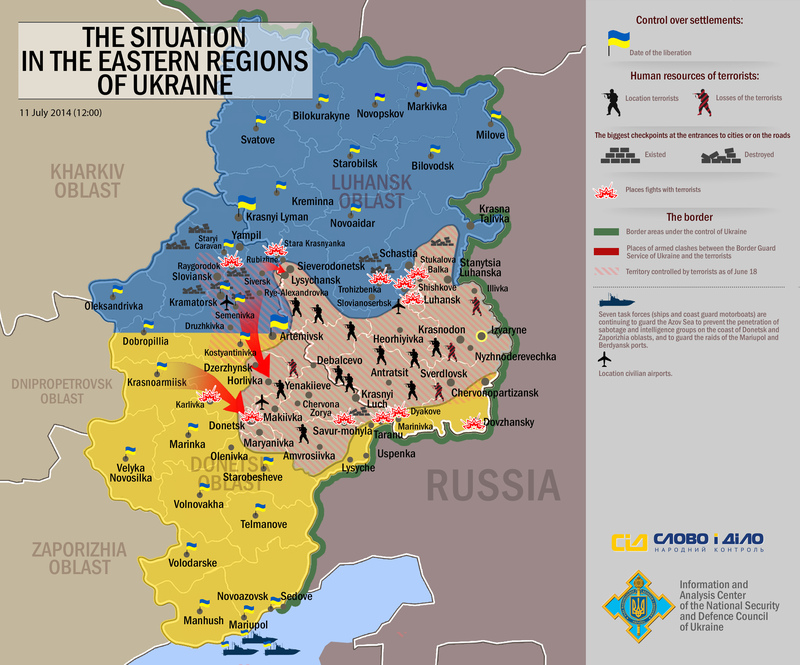 The situation in the eastern regions of Ukraine on 11 July 2014. Image courtesy of the National Security and Defense Council of Ukraine. However, on the morning of 11 July 2014, the situation suddenly changed. A massive and unexpected artillery attack on units in the Zelenopillya region killed 30 and wounded over 100 soldiers. In the days and weeks that followed, the units at the border were subjected to dozens of additional artillery attacks. By late July 2014, the massive bombardment reversed Ukrainian gains and contributed to the encirclement of portions of the Ukrainian armed forces. A separatist offensive across eastern Ukraine began simultaneously with the artillery attacks, leading to the separatists capturing much of the Russian-Ukrainian border along with vast areas of the Donetsk and Lugansk oblasts. Artillery attacks on Ukrainian forces near the border proved to be an important factor in turning the conflict in favor of the separatists. Using in-depth analysis of satellite imagery and social media sources, this Bellingcat investigation brings new evidence to help clarify to the origins of these artillery attacks against Ukrainian armed forces. The starting point for this Bellingcat investigation was the distribution of updated satellite imagery from Google (DigitalGlobe satellite imagery) with a panchromatic resolution of 0.5m from the territory of eastern Ukraine and its border regions with Russia (17 July to 31 August 2014 satellite images). Additionally, the Bellingcat investigation team analyzed videos shared on social media (YouTube and VKontakte) and geolocated the events captured in these videos to key sites involved in the artillery attacks on Ukraine. From the satellite imagery, the Bellingcat investigation team located artillery impact crater fields from artillery fire and conducted extensive analysis on a crater-by-crater basis. In the examination of each area, our team created a novel analysis method based on internationally-recognized ‘on-the-ground’ procedures to determine the trajectory of the artillery fire. Both types of craters are suitable for determining the trajectory of artillery fire. In reality, the trajectory of the projectile is determined by a variety of factors, such as the type and hardness of the ground struck, wind direction and speed, and the type of projectile. Our team adopted a simple linear trajectory in our analysis, but the actual trajectory may vary somewhat due to the aforementioned factors. In a 14 July 2014 summary of the “anti-terrorist operation,” Ukrainian media reported that an attack took place on positions of the Ukrainian armed forces in the vicinity of Amvrosiivka. It was suspected that the origin of this attack was from the territory of Russia. On the satellite image below, taken on 16 July 2014, an extensive crater field south of Amvrosiivka is visible, located at the coordinates 47°45’52.38″N 38°30’47.65″E. The crater field near Amvrosiivka from the 14 July 2014 attack, positioned at 47°46’1.07″ N 38°30’43.16″ E. Google Earth satellite image date 16/07/2014. The Bellingcat investigation team counted a total of 330 craters in this crater field, and determined the observable direction of each impact crater based on the analysis methods previously described. From these 330 craters, the average trajectory was calculated, and was determined to be 193.97°, i.e. from the south-south west (180 ° being due south). When screening for possible firing positions from this trajectory, the Bellingcat investigation team found a firing position 14.6km from the crater field. Burn marks are visible at this location, which is on Russian territory and approximately 750m from the border near the Russian village of Seleznev at the coordinates 47°38’13.52″N 38°28’9.69″E. Based on our crater analysis, we judge that these were very likely the five firing sites that caused the craters near Amvrosiivka. There are several pieces of evidence that lead us to believe that these strikes were performed by five 122mm BM-21 Grad or 9K51M Tornado-G Multiple Rocket Launcher Systems (MLRS) as opposed to BM-27 Uragan, the BM-30 Smerch, or other types of field artillery. It is well known that BM MLRS create large areas of smoke behind them during and after firing, of which many examples are available online. This area of intense smoke and heat results in burned/singed ground behind the MLRS, and are visible from Google map satellite images. Such burned areas are visible at the firing position considered for the Amvrosiivka attack, and so we judge that these were very likely MLRSs. Firing position near Seleznev. Position: 47°38’14.38″N, 38°28’9.77″E. Google Earth satellite image date 16/07/2014. Analyzing the satellite imagery of the firing position also gave us evidence for determining the type of MLRS most likely used to conduct the artillery attack. The visible tracks that lead to the site come from further inside Russian territory. The tracks of the vehicles that entered and exited the field to reach their firing positions are visible from the satellite imagery. This leads us to believe that there was no cross-border (Ukraine to Russia) movement of military equipment for this particular location. In the Russian military three MLRS systems are primarily used (see Figure Russian MLRS systems). The measurement of the average track width from the satellite images yielded an average value of 2.40m. As the resolution of the satellite images is 0.5m, the tolerance for this measurement is 1.9 to 2.9m. In comparison, the widths of the BM-21/Tornado-G, BM-27, and BM-30 are 2.4, 2.8, and 3.1m, respectively. The track width determined from satellite imagery is suggestive of a smaller vehicle, but because of the potential error due to imagery resolution, this is not conclusive. Using the satellite images, we were able to determine the turning radii of the vehicles. The smallest turning radius was measured as 14m. The BM-27 and BM-30 MLRS have two steered front axles, so if they were used in this instance, we would expect to see evidence of two overlapping sets of wheel tracks in the turns leading to or from the firing position. However, the satellite image shows only the traces of one clear, single track. Based on this evidence, we conclude with high probability that a BM-21 Grad or 9K51M Tornado-G was used for this attack. The visible traces of the vehicles also fit well for the typical spacing of BM-21/Tornado-G systems in battle formation (see the image above for the spacing of the units visible from the satellite image). Our investigation of this attack shows that the average trajectory of the craters pointed toward the direction of the suspected firing positions with a high degree of accuracy; the maximum-to-minimum deviation of the analyzed crater angles is only 0.2%. Additionally, a measurement in the other direction, extrapolating the trajectories of the visible burn marks at the firing position, revealed that the trajectories led directly to the center of the artillery crater field. In early July 2014, units from the 72nd Motorized Brigade, the 79th Airmobile Brigade, the 24th and 51st Mechanized Brigades, and elements of the 3rd Separate Special Forces Regiment were tasked with securing the Russian-Ukrainian border south of the separatist-held towns from Marynivka to the Izvaryne checkpoint. This area, covering over 150km of border, was known as “Sector D”. From the end of the ceasefire on 1 until the 11 July 2014, Ukrainian units advanced quickly and found relatively little resistance until they reached the Chervonopartyzansk/Gukovo checkpoint. Then, the situation changed dramatically. The Zelenopillya artillery attack against Ukrainian forces on 11 July was followed by artillery attacks against large conglomerations of Ukrainian units in the area close to Dolzhanskaya-Capital mine and Panchenkove, Chervonopartyzansk, Khmelnytskyi, Biryukove, Dolzhanskyi border control point, and the Dyakove region. As the world diverted their attention on the horror of the Malaysian Airlines Flight 17 (MH17) shoot down on 17 July 2014, the situation sharply deteriorated for the Ukrainian units on the eastern border. On 22 July 2014, Dmytrivka, a town on the supply road to Sector D, came under attack from separatists. For the next two weeks, transport along the roads east of these towns greatly limited resupply and reinforcement for the trapped units (see examples here, here, and here). From interviews and media reports, it was evident that conditions were dire. Despite this, the units on the border continued to hold their positions. On 3 August, a breakthrough by Ukrainian units in the west unblocked a potential resupply route (between Dyakove and Dmytrivka) to the beleaguered units on the border. That same day, pro-Russian forces sharply increased the number of attacks against the trapped units on the border. Out of ammunition, on 4 August, over 400 Ukrainian soldiers from the 72nd Mechanized Brigade fled across the border to escape the constant bombardment. By 8 August, the remainder of the 72nd and 79th brigades had broken out of the encirclement, and around 1,000 survivors were able to regroup with other units near Savur-Mohyla. Massed artillery attacks upon Ukrainian units in the border region east of Dmytrivka were undoubtedly a key factor in the retreat of Ukrainian units from Sector D. However, until now, the trajectories and firing positions of the artillery attacks that led to this defeat have not been analyzed. In the following section, we analyze two of the largest visible artillery attacks close to Chervonopartyzansk and Sverdlovsk, where Ukrainian units were hit by hundreds of visible artillery shells during July and August 2014. On 14 July 2014, consistent accounts emerged in both Ukrainian and Russian media outlets that clashes took place in the vicinity of the mine called ‘Dolzhanskaya-Capital’, close to the Ukrainian town of Panchenkove. Significant disruptions to the mine’s power system affected pumps and the ventilation system, leading to the evacuation of 278 miners. The satellite image from 8 August 2014 shows the cause of the power outage: large amounts artillery fire that destroyed several electricity poles in the vicinity of the mine. Analysis of the damaged electricity poles and their connections suggested that the only lines leading directly to the mine were affected. Therefore there was no evidence to suggest that power to nearby towns was disrupted due to this attack. The Bellingcat investigation team researched media reports from mid-July to confirm attacks from this time period. Official Ukrainian government sources reported artillery attacks on 23 July and 1 August, and Ukrainian media sources also reported attacks in this area on 16 and 24 July, and 1-4 August. The following comparison of maps provided by separatist sources shows the course of the battles in July and August throughout the region and also suggests several specific dates for attacks on Ukrainian forces. The Bellingcat investigation team analyzed a number of videos shared on YouTube and VKontakte (VK), Russia’s most popular social networking site. From these sources, it was established that at least two attacks occurred on 16 July 2014. Next, our team analyzed the crater field near the Dolzhanskaya-Capital mine outside of the village Panchenkove by using satellite imagery from 8 August 2014. A total of 813 craters were measured. Analysis of the calculated trajectories in the attacked crater field reveals that there were six separate attacks from five different directions. With maximum differences of 300m at a shelling distance of 15km, all of the calculated trajectories can be traced to five separate firing positions. Every one of these – with the exception of the position near Chervonopartyzansk, Ukraine, which is close to the border – is clearly within the territory of Russia. The firing position near Gukovo is particularly noteworthy because numerous videos have been shared on social media showing artillery fire. The firing position shown in these videos will be examined separately in the following section. The Bellingcat investigation team has also found that at all of the firing positions except one (Chervonopartyzansk), vehicle tracks show both an arrival from and departure to areas within Russia. In other words, in four out of five cases there were no observable tracks linking the firing positions to Ukrainian territory, and all the observable tracks near the firing sites were exclusively within the territory of Russia. On 17 July 2014, a series of videos were shared on YouTube and VK showing an attack with MLRS launchers. The attack occurred on 16 July 2014 in the vicinity of Gukovo, Russia. This attack has already been located by a number of blogs and articles, for example by the Interpreter Magazine. The Bellingcat investigation team has found six videos on social networks that show the events of 16 July 2014 near Gukovo. Two of these videos were captured from the edge of the Kovalevsky pond on the afternoon of 16 July 2014. Video001 shows several MLRS salvos west of the pond. This video has been successfully geolocated a number of times by various journalists, bloggers, and open source investigators. Video002 shows burning fields northwest of the same pond that appears in Video001. It was suspected at the time that this fire came from MLRS launchers. Other Grad rocket volleys were documented in four other videos on the same day in the evening. Each of these videos was captured exactly at sunset, leading to our determination that the videos were captured at approximately 19:15 (MSK, local time). An important feature of this collection of videos is that each was captured from different angles facing the firing position. The Bellingcat investigation team was able to precisely determine the location of the firing position from the exact locations of the cameras and the angle and positions of the Grad launchers in each video. Video003 was captured from a cherry tree on a residential plot on Bazarnaya Street 84 in Gukovo. The identifying features of this video include buildings in the center of the video, the cherry tree as camera location, and the angle and distance from the firing position. Video004 shows the firing position on the southwest side of Kovalevsky pond. The identifying landscape features in this video are the solitary tree on the right side of the camera’s perspective, the big bush in roughly the middle of the perspective, and the utility poles on the far left side of the perspective. The firing position in Video005 is visible from the southwest side of Kovalevsky pond. The identifying landscape features in this video are the same as Video004: a big bush, and utility poles. Video006 was captured from a residential building on Botanicheskaya Street 7a in Gukovo. The identifying features of this video include a building on the right side of the video, another building on the left side, the road below, and the angle and distance from the firing position. On the satellite image below, taken 8 August 2014, the intersection of the lines clearly shows two visible burns, marking the firing position. The positions of the cameras in the previous videos clearly point to a firing position north of Platovo. These firing positions are visible from satellite imagery of the burned fields (image above). As evident from the satellite imagery, there are two visible firing positions for four Grad MLRS launchers at 48°05’25.0″N 39°54’45.3″E. The Bellingcat investigation team has measured the direction of the traces of fire and calculated a trajectory for each firing position. The calculated trajectories of the burn marks point towards two different crater fields on Ukrainian territory (image below). After analysis of the individual craters in the artillery strike site, we found that the calculated trajectories of the firing positions fit almost exactly the two trajectories determined from the artillery crater analysis of the crater field near Dolzhanskaya-Capital mine. Thus, from the evidence of crater field analysis, social media geolocation, and local media reports, the Bellingcat investigation team has determined that the artillery attacks on the Ukrainian armed forces positions near the Dolzhanskaya-Capital mine were conducted on 16 July 2014 from firing positions near Gukovo, within the territory of Russia. The Bellingcat investigation team has located the camera position of these videos as being in the crater field in the vicinity of the Dolzhanskaya-Capital mine. The same destroyed military vehicles are clearly visible in the 8 August 2014 satellite image from Google Earth, taken just after the Ukrainian forces pulled out of this border area. These videos show the extent of the destruction of the Ukrainian forces’ equipment based close to the Dolzhanskaya-Capital mine. Many heavily damaged trucks and armored vehicles are visible in the video, including a truck, several BMP-2 units, a self-propelled artillery unit, BM-21 ‘Grad’ launchers, and tanks. Ukrainian Army BMP-2, MT-LB and rocket launchers were left abandoned near Sverdlovsk on Saturday, after the 72nd Motorized Brigade suffered heavy losses during mortar shelling from the Lugansk People’s Militia on Friday. Lugansk People’s Militia has said that heavy losses were suffered by the Ukrainian army in both hardware and personnel after the Kiev troops were hit by the 12mm [sic] mortar shells. The video was released on 28 July 2014, which means that the day of the attack (the previous Friday, as mentioned in the description) was the 25 July 2014. Using the video footage, the Bellingcat investigation team has located the camera location of the Ruptly video as being a crater field close to the village of Khmelnytskyi, south of Sverdlovsk. Analyzing the satellite imagery, The Bellingcat investigation team found a total of 209 craters. We were also able to determine three primary attack trajectories. The trajectories of nine craters point directly east (green line). Two other trajectories (red and cyan lines) originate in a southeasterly direction. All three trajectories clearly point to firing positions within Russian territory. These firing positions are directly connected to the military camp of the Russian army near Pavlovka and a smaller firing position close to Malyy. The Bellingcat investigation team used internationally-recognized methods and satellite imagery to analyze a total of 1,353 artillery craters in eastern Ukraine and determine their trajectories. We located firing positions that closely matched these trajectories, all of which were inside Russian territory with one exception (which was less than 2km from the Russian border). Three artillery attack case studies were investigated in this report: Amvrosiivka (14 July 2014), between Dolzhanskaya-Capital mine and the village of Panchenkove (16 July to 8 August 2014), and Khmelnytskyi (25 July 2014). Artillery crater analysis concluded that there were a total of ten primary attack trajectories across all the case studies. From each of these attack trajectories a firing position was identified. Nine of these firing positions were – without any doubt – within the territory of Russia, with three within 400 to 800m of a military camp. The one position in Ukraine was near Chervonopartyzansk, within the territory of Ukraine 1.2km south, and 1.5km north of the border with Russia. The target trajectory of three firing positions was determined through analysis of scorch marks created by MLRS fire. All three of these trajectories led precisely to the target area of the crater field, allowing our team to calculate the trajectories in both directions (i.e., from crater field to firing position and from firing position to crater field). Vehicle tracks are also visible and showed clearly that they originated from, and led back to Russian territory near seven firing positions. The firing position for an attack on 16 July 2014 in a field north of Gukovo, Russia was documented in a series of videos found on social media. Four of these videos show the same instance of 122mm MLRS fire from different perspectives. By comparing the video locations and views, the Bellingcat investigation team was able to geolocate the exact firing position. With a small deviation (300m at a shelling distance of 15km), the firing position geolocated through video analysis was the same as that from the crater analysis. This study has provided compelling evidence that a series of artillery attacks on Ukrainian territory were conducted between 14 July and 8 August 2014 from firing positions within Russia. The first attack on 14 July 2014 originated from Russian territory near the Russian village of Seleznev and was directed towards positions of the Ukrainian armed forces south of the Ukrainian village of Amvrosiivka. Four attacks were conducted near Gukovo, Russian on Ukrainian armed forces close to the Dolzhanskaya-Capital mine and the village of Panchenkove between 16 July and 8 August 2014. Two additional attacks were conducted on this area from Russian territory north of Gukovo. On 25 July 2014, an artillery attack was conducted on the positions of the Ukrainian 72nd Mechanized Brigade near Khmelnytskyi village, south of Sverdlovsk. These attacks also came from locations within Russia, specifically from a military base in Pavlovka and a position east of the village of Malyy. Well this is pretty biased and amateurish. From what I read you only made assumptions on the direction, what about the distance? What about the slope, elevation and terrain conditions? This is really very fishy and would absolutly be rejected in a peer reviewed publication. Ignorance, ignorance everywhere. So much meaningless opinion, hurrr durrr. Seriously, who are you, one of Putin’s hired Internet trolls? It is already known that Putin pays hundreds of people to support his lies and propaganda on the Internet by posting comments on articles and social media. Obviously graphics editors are used to prove points and make them clear to readers. Publicizing such material without it makes it much harder to distinguish points made only through mere words. Like you say yourself; you only need to convince the retarded majority of the world, which apparently includes you. Brilliant piece of debunking in the research (and in the comments section). Very entertaining, actually, to see the paucity of argument to approach refuting, what is, obvious. I would acknowledge the difficulties in not being on the ground to find out for sure. However, coupled with (a) Russia invading Ukraine (b) Russian soldiers captured in Ukraine (c) Russian military equipment in Ukraine and (d) President Putin negotiating with Presidents Hollande and Merkel over Ukraine, I see Putin having some involvement in the current invasion. Thats to put it mildly. It seems, now, through this that The Russian Federation have stopped the pretence. So should everyone else. After the firing locations have been identified, is there a chance to identify who was firing from there? great work, thank you!!!! its amazing how far russian controlled bots now can manipulate thinking in western countries. its horrible. and sadly our own (ours=western) journalism is unreflected on what us and nato militaries do. well. i definetly will point u out in my facebook profile. im not a paid breathing bot… but i can stem against the tide! every voice counts. please keep up ur work. greetings from germany that is in the middle of this media war right now! Thank you Hendrik, and know, you are not alone. I don’t understand what you mean when you refer to a ‘linear trajectory’. It is my understanding that most projectiles when thrown or fired must take a calculated parabolic path to reach their target. A parabolic path is not linear. Is this some military usage of the term ‘linear’ that I am not familiar with? Lisa, you are correct to say that projectiles follow a parabolic path as seen from the side, through the effect of gravity. Seen from above that same parabolic path looks like a straight line – unless the wind blows it off course. That’s why you can’t shoot arrows round corners. A skilled sportsman can curve a ball by putting spin on it, but rocket launchers are designed to avoid doing that as it would make the rockets unstable in flight. The linear trajectory refers to the view from above – like the coloured lines drawn on the satellite images. More great sleuthing! Keep it up.